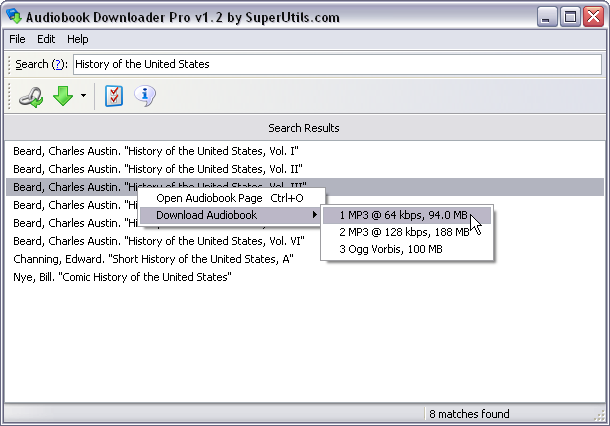 Audiobook Downloader Pro is a fast and convenient download manager of free audio books from the LibriVox and Internet Archive catalogs. It enables you to effectively find an audiobook that you are interested in, and download it at maximum available speed. With the help of this program you can anytime pause downloading files, and then resume these downloads when you will need it. Also, it can be integrated with the Angel's Vox audiobook player. Downloader of free audiobooks from the LibriVox and Internet Archive catalogs. ...... You are also able to access a book's summary by using the Open Audiobook Page feature. Audiobook Downloader Pro can be integrated with the Angel's Vox audiobook player. Or you can simply play back downloaded audiobooks with a default associated media player. The auto-update feature will provide you access to the latest available program features and audio books. Try Audiobook Downloader Pro for 30 days, and if you find it useful, then please register it. An advanced download manager with java! Qweas is providing links to Audiobook Downloader Pro 1.2 as a courtesy, and makes no representations regarding Audiobook Downloader Pro or any other applications or any information related thereto. Any questions, complaints or claims regarding this application Audiobook Downloader Pro 1.2 must be directed to the appropriate software vendor. You may click the publisher link of Audiobook Downloader Pro on the top of this page to get more details about the vendor.